Multi-Fold Mobility Scooter and Wheelchair Ramp - 12 ft.
12 ft. Portable mobility scooter and wheelchair ramp works great for traversing steps, curbs, and other raised surfaces with power-chairs, scooters, wheelchairs, and as a walk ramp. Includes a durable grip tape surface for high-traction use in all weather conditions. Recommended for elevated surfaces up to 24" with wheelchair occupied or 36" walking. Includes a built-in comfortable carrying handle. 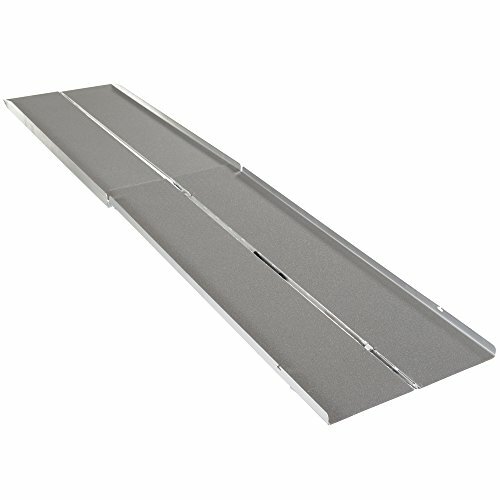 The WCMF-12 portable wheelchair ramp features a multiple-section design enabling the ramp to fold to 77"L x 16"W x 9"H for compact, portable storage. Made from durable aluminum welded construction with a 600 lb. Maximum distributed weight capacity.